The Spanish guys from Womb (a band that includes members from e.g. 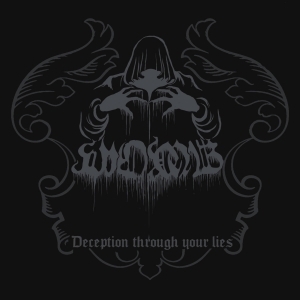 Winterstorm, Vikingore or Windblown) initially released their debut full length album Deception Through Your Lies at the end of May 2015 in its digital form. On November 30th Doom-giant Solitude Productions release that material on CD, in a co-operation with Hypnotic Dirge Records, and this in an edition of 500 copies. There are five compositions on it, lasting in between six and eight minutes each. Deception Through Your Lies brings very traditional Funereal Doom-Death Metal, atmospheric, melodic and melancholic in all aspects. It’s slow, with extremely deep grunts, lots of piano, beautiful guitar leads, well, actually about everything that is needed within this specific sub-scene. And here it comes. As you can guess, this album totally lacks of an own face. Within this genre, so many bands try to sound alike. Sometimes it’s a curse, then again a blessing. It’s a curse when the lack of originality goes hand in hand with minor songs, with a bad sound, with an inferior performance, or with a copycat mentality. It’s not a ‘problem’, as far as I am concerned (and since I am the reviewer, once again, it’s my personal opinion that will be revealed right here), when those elements are done the right way. As a matter of fact, Womb’s Doom-Death is not bad at all. As said before, it mainly dwells on the (predictable) elements of the scene, but Deception Through Your Lies has quite some great songs. The song writing and the performance are ear candy for the fans (everything in the vein of Thergothon, Evadne, Evoken, Monolithe, Unholy and the likes might do…). The production too is more than acceptable, with a cool mix – though maybe the vocals are little too foregrounded??? There are pros (great drum patterns, the fabulous guitar leads and tremolo riffs, or the universal execution) and cons (the sometimes predictable what’s-next-to-come-elements or the melodic-soaring voices), but let’s be sure about this: the Doom-Death scene was created almost three decades ago, and it came to its peak two decades ago. Since then, lots of bands did arise, but the truth is that the better things that were recorded in mean time were those that remained within the origins of the earliest years. No matter if you’re focusing on the British, Dutch, Finnish or, for my part, the Antarctic scene; the basics remain the same and any ‘progressive’ influence might destroy the best intentions. So I’ll keep it short: fans of this scene just must pay attention! Womb do a great thing with Deception Through Your Lies, and the variation in structure (acoustic intermezzos, for example) is a necessary yet actually present fact. Doom-Death adepts, there’s no reason not to go for this release, on the contrary!